This non-fiction work will give readers a vivid look inside the quirky, spiritual adventures of the Agranovich family, where the “weird, crazy and abnormal” become the norm. In their home, otherworldly encounters are accepted like grades and shoe sizes, and homework sessions often become cosmic lessons. 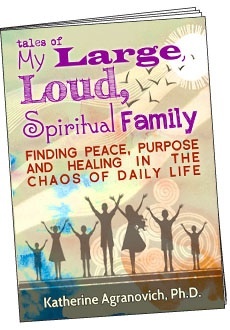 Tales of My Large, Loud, Spiritual Family explores how to find peace, purpose and healing in the chaos of daily life. In order to embrace their children’s spirituality, Felix and Katherine Agranovich, atheist Jewish refugees from Soviet Russia, had to undergo a profound spiritual transformation. Tales of My Large, Loud, Spiritual Family offers hope, courage and inspiration to parents committed to raising their children as spiritual beings. The stories in this book will mystify, enchant, and change views on family dynamics forever. Inside the pages of Tales of My Large, Loud, Spiritual Family, Katherine realistically depicts the memorable roller coaster ride of mystical visions, spiritual insights and shocking premonitions that have occurred in her own home. Sharing experiences of her hypnotized daughter receiving sound advice from angels on how to pass a math quiz, her son being awaken by a headless man, and her non-psychic husband, who betrayed by a business partner, meets with an astral financial advisor in the midst of an economic crisis, Katherine depicts her family’s extraordinary encounters that open the gates of consciousness and allow the realm of spirits to burst through. Readers who wish to experience this spiritually enlightening work and study topics such as Family Life, Spiritual Parenting, Thriving Marriage, Business Success, Personal Empowerment, Inner Fulfillment, Holistic Healing and Inner Transformation can purchase it online at Amazon.com.